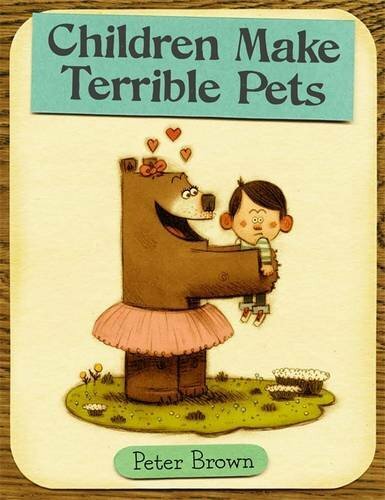 Children Make Terrible Pets is a 40-page hardcover picture book about a bear cub named Lucy who, on a walk through the woods dancing and frolicking about, runs across someone admiring her from behind a bush—someone alone and frightened. When Lucy yells at the intruder to reveal itself, a young boy steps into the clearing, relinquishing his hiding spot and squeaking in fear. Falling instantly in love with the cute boy, Lucy brings the youngster home to show her mother, begging her to keep him as a pet. Her mother tells Lucy that children make terrible pets, but Lucy is determined to prove her mother wrong. She names him Squeaker because he makes funny squeaking noises and takes full responsibility for his upkeep and care. Lucy is true to her word and is very attentive to Squeaker. They play together, eat together, and even take naps together. But not everything is fun and games. They have issues. Squeaker plays with food, gets dirty, throws tantrums, tears apart furniture, and more. Just when Lucy thinks things couldn’t possibly get worse, Squeaker disappears. Lucy must search high and low to find her lost pet. Children Make Terrible Pets is an interesting twist on how children find their pets and discover each other’s idiosyncracies. Youngsters will enjoy the simple text and detailed illustrations. The irony and humor in the story will bring a smile to the reader’s face—the ending providing an especially good chuckle. Children Make Terrible Pets is based on the author’s experiences. Of the many pets he coveted, frogs were a favorite. After collecting a few and bringing them home, little Peter gets all set up to keep the frogs as pets. His wise mother asks him if he would want a wild animal to make him its pet. Can you guess Mr. Brown’s answer? This is a perfect read for children between the ages of 4–8.